CVS News Uncategorized The future of cardiovascular education? The future of cardiovascular education? Perhaps a bit of a dramatic title, but there may be some merit in it. 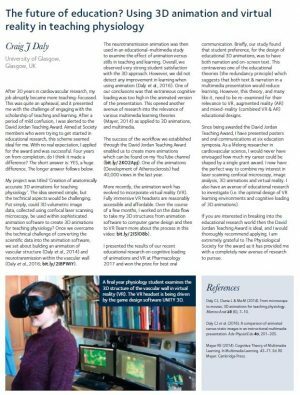 The article, shown in the image, has just been published in the most recent issue of Physiology News and sets out our progress over the past 4 years in developing new educational materials. Essentially, the novel aspect is the use of confocal microscope based data to build 3D animations and virtual reality environments. Confocal laser scanning microscopes are used to scan (in 3D) small biological samples. These are basically just fancy microscopes that use lasers as an illumination source. The result of laser scanning is the production of a series of perfectly aligned images down through the depth of a tissue (or tissue slice). These serial images can then be reconstructed to create a digital 3D model. Once you have a 3D model you can then use that as a ‘set’ in which to create a digital movie (animation). You can then go one stage further and create a virtual environment from the resulting animation. So, this really could be the future of teaching for cardiovascular science and biology in general. Exciting times indeed!